I have had my David Austin Perdita rose for about 20, maybe 25 years. It started out in a large flower garden full of very old rose varieties and a few David Austin roses. The bed was solid clay. I was a beginner and gave up. I re-homed the roses...except Perdita. I moved it into a small raised herb garden that was where the lasagna bed now is. It lived there for a very long time. It stayed very small. The clay eventually came up into the raised beds and I gave up. I took the beds out and moved Perdita into my perennial border. It grows beautifully there. It never got more than about four feet in the clay beds, but now I have to cut it back a couple times per growing season so that it doesn't block out the kitchen window. Last year I started feeding the flowers for the first time. I took a lot of flowers out and replaced them with new varieties. I am going to put a couple bags of alpaca manure in the garden shortly. I cannot wait to see how this incredible rose looks this year. Yes, there's no denying that that is an incredibly beautiful flower. Almost too good to be true! It is truly exquisite. 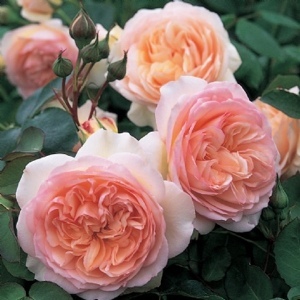 It reminds me a lot of his Abraham Darby rose. My favorite rose colour. If we lived over the back fence from each other, I could have gotten your rose clippings to root for my own yard! I would have cut some for you!! They are easy to start. Are you in Canada? I agree 100%. We are so lucky on Vancouver island. We can grow so much more than most of Canada. Like a little pocket of paradise. Pretty cool that you can do it in zone 5. I'm impressed. Love your beautiful rose. I love my David Austin - Mary Rose (named after the King Henry VIII ship that sank) One year I didn't do a winter prune, didn't bother it and didn't flower any earlier. They are just so beautiful aren't they Sandi? I really love mine.